As part of AMP’s biennial Amplify Festival, the company has launched a virtual experience for event attendees showcasing iconic Australian environments. 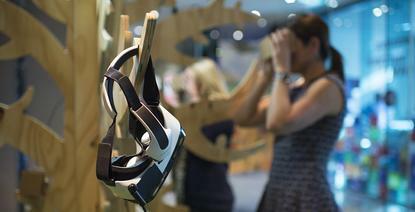 The Virtual Voyage installation allows consumers to use either a Google cardboard headset, powered by a Google Nexus device, or a Samsung VR Headset, powered by the Samsung Galaxy smartphone, to participate in a virtual reality experience. The digital-led activation is being trialled as part of the festival, which runs until 5 June, before being rolled out into shopping centres. AMP Capital Shopping Centres head of shopping centre marketing, Belinda Daly, said Virtual Voyage was about creating a point of difference for the retail malls. AMP also claims to be one of the first Australian brands to create a series of short 3D effect videos as part of a branding exercise across social media. The group has created four posts initially, aimed at reflecting the shopping centre group’s food and fashion focus through fabrics, fresh fruit and coffee. Each shopping centre will run a selection of the posts across Facebook and Instagram accounts. The 3D posts were produced by Hausmann Communications and Dangermouse Productions and don’t require any glasses to view. Hausmann group digital director, Jenna Setford, said the 3D effect was a great fit for AMP’s shopping centres given the broad range of audiences it needs to target. AMP represents the first retail centres to rollout the technology since it was introduced in the US earlier this year. AMP owns 23 shopping centres in Australia and New Zealand including Macquarie Centre, Garden City (NSW), Malvern Central (Victoria) and Pacific Fair (Queensland). The group’s week-long Amplify Festival is designed to encourage customer-led innovation and encompasses an exhibition, talks, workshops, breakfasts and seed funding events. More than 2000 visitors are expected to take part.